This article is about the first YouTube video. For the Chris Crocker documentary, see Me at the Zoo. Me at the zoo is the first video that was uploaded to YouTube. It was uploaded on April 23, 2005 at 20:27:12 PDT (April 24, 2005 at 3:27:12 UTC) by the site's co-founder Jawed Karim, with the username "jawed" and recorded by his high school friend Yakov Lapitsky. He created a YouTube account on the same day. The nineteen-second video was shot by Yakov at the San Diego Zoo, featuring Karim in front of the elephants in their old exhibit in Elephant Mesa, making note of their lengthy trunks. All right, so here we are in front of the, uh, elephants, and the cool thing about these guys is that, is that they have really, really, really long, um, trunks, and that's, that's cool, and that's pretty much all there is to say. In 2013, YouTube introduced a new requirement that forced all commenters to use Google+ accounts. In response to this, he updated the description of "Me at the zoo" and added two annotations to the video. The Los Angeles Times explains that "as the first video uploaded to YouTube, it played a pivotal role in fundamentally altering how people consumed media and helped usher in a golden era of the 60-second video." The Observer describes its production quality as "poor". As of April 22, 2019, the video is still active on YouTube and has received more than 66 million views, 1.8 million likes, 69 thousand dislikes, and over 2.2 million comments. ^ "Extract Meta Data". www.amnestyusa.org. Retrieved February 22, 2017. ^ Hartley, Matt (February 19, 2010). "Ten of YouTube's most influential videos". Canwest. ^ McGuinness, Ross (April 15, 2010). "Elephants to Gaga". Metro. p. 34. IT began with a spectacularly ordinary 18-second clip of man at the zoo, watching some elephants ... It has been viewed almost 2 million times. ^ Meltzer, Tom; Phillips, Sarah (October 23, 2009). "G2: A First Time For Everything". The Guardian (London). p. 14. "Me at the zoo" is a man called Karim's 19-second long report from the elephant enclosure at San Diego zoo ... But its historical significance means that it has had well over a million hits so far. ^ Heffernan, Virginia (September 6, 2009). "Uploading the Avant-Garde". The New York Times. Retrieved April 4, 2011. The first video on YouTube was uploaded at 8:27 p.m. on Saturday, April 23, 2005. 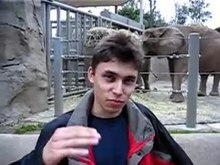 It's called "Me at the Zoo," and it features the musings of Jawed Karim, one of the site's founders, as elephants nose around in hay behind him. ^ Pham, Alex (April 10, 2010). "YouTube turns 5, can't wait to grow up". Los Angeles Times. Los Angeles, California, USA: Eddy Hartenstein. ISSN 0458-3035. OCLC 3638237. Archived from the original on April 21, 2011. Retrieved April 20, 2011. Born as a clearinghouse for quick, quirky homemade videos, the site now seeks to add more professional — and profitable — content.